It’s hard enough getting older. Imagine growing older, with all of its attendant limitations, while serving a sentence behind bars. Your life is severely restricted and your options to maintain a quality of life are few. For photographer Jessica Earnshaw, the subject of aging prisoners became a passion and a project. 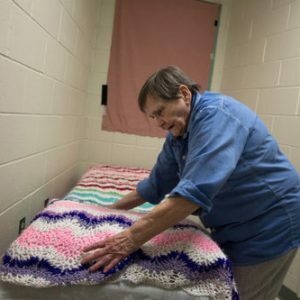 Through her work, “The Aging in Prison Photo Project,” the real lives, and limitations, of this select group of seniors becomes reality for the uninitiated. Photographing both men and women in the Maine prison population, and recording their words and stories, Earnshaw has created a humane and authentic portrait of what it’s like to live out your days while living in a cell. Read more about Jessica Earnshaw’s project Here, and find her own website Here.